And really, I want to know if you are with me. Hunger is a real issue in our nation, and one each and every one of us can help with. Here are some of the things I learned during #BlogMob #Hunger that can help our neighbors. Produce to People This is a distribution the Food Bank hosts at not only the Duquesne location but at other local pantries throughout the month. If you know someone who is in need of food, especially fresh produce, let them know about this program. It is not limited to folks who receive food benefits—if there is a genuine need, recipients just need to sign a proclamation of need. Tote Bags help! Events like Produce to People are what inspired the Tote Bag Project to focus on getting reusable grocery bags into the hands of Food Bank recipients. As I was walking into the Food Bank, I saw many kinds of “bags” to gather the 40 (or so) pounds of food that would be distributed—suitcases, an old potato sack, laundry baskets, rolling shopping bags, pockets, and tote bags. If every patron had a handful of tote bags to help them bring their haul home, it surely would make life easier (just imagine toting 40 pounds of produce on the bus in a typical grocery bag). A sad truth learned, although almost 20,000 tote bags have been donated in this past year, the Food Bank is now out of the tote bags and could use more. Consider hosting a tote bag drive in your workplace, religious center, or even among your neighbors. ‘lil Miss A is asking you to bring some to her birthday party to make a small dent, too. Key donation items include peanut butter, tuna, and low-sugar cereal. 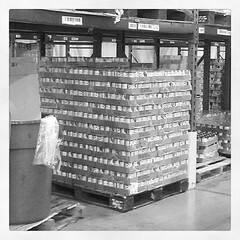 These are things the Food Bank should never have to run out of, but without the help of donations, this is possible. Sure, the warehouse has a nice stock of peanut butter, but with pantries across several counties, it would be easy to imagine the possibility. Do what you can to help with this—if you have a food drive, consider sending these items or even asking those helping out to focus on these. Funding cuts are real issues, too. Money going to food programs is facing serious cuts. There are a few things you can do to help with this. One, when you are asked to give money to the Food Bank, know that it goes a long way. Because the Food Bank orders wholesale, a $1 donation can bring about $4 of buying power. 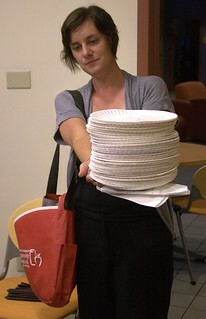 Two, you can sign a paper plate (even virtually, click here!) to send to Governor Corbett a message that you want to help protect the State Food Purchase Program (instead of this falling under a budget cut). While the #BlogMob group toured the Food Bank, participants in Produce to People could write out a message on a paper plate that will be physically delivered to the Governor at the end of Hunger Action Month. We got to fill one out too, and it brought some tears to my eyes. It’s not all doom and gloom! Sure, those observations above are sort of scary, but there are good things happening. On Thursday night, each produce distribution station was accompanied by an informative table. For instance, Giant Eagle dietitians were there talking about a plate portions; participants could register to vote; and there were health screenings. This new feature of Produce to People seemed to me like a great idea, and I hope it sticks. The Food Bank nutritionist was on hand to show recipients how to make a healthy Harvest Stew using acorn squash, onions, and collard greens that were distributed that night. I was inspired, learned how to cut an onion without crying (it works), and will be making this meal for dinner tonight! Bought and donated food is marked with a 1, 2, or 3 depending on nutritional value and movement analysis. This helps local pantries with ordering so that they can properly order their distributions. Volunteers are making things happen! You can volunteer by repacking, putting together boxes for Seniors, or carrying food to recipients’ cars. Every little bit helps. Community Table is a new program where chefs are donating extra “plates” of food—they make the extras, so these are not items that have sat out—and a truck comes around and picks up the food, getting it quickly into the hands of those who need it most. Kids. Kids. Kids! They learn so much, those ‘lil sponges! Miss Ivy goes to schools and groups and talks to kids about hunger and how they can help. Her cubicle was covered in inspiring posters children have made…if only we all had the heart of a ‘lil child, this world really would be a better place. During the night, those of us in attendance learned lots about how we can take action. I hope this has inspired you. If you want to hear more about the night, go visit Emily, Elizabeth, or Lou (he wasn’t able to attend, but was still uber-inspired and interacted in our tweets, LOVE!) to hear more. 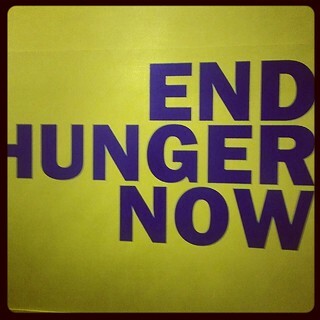 The Tote Bag Project has also pulled together a great Storify site with our top stories about #BlogMob #Hunger, do read! Here’s where I NEED you. Comment below—what action are you going to take in this 2nd half of Hunger Action Month? Will you tweet about this post and/or hunger (use the “Tweet” button below!)? Will you organize a food/tote drive? Will you sign up to be a Food Bank volunteer? Leave me some love below, my heart needs to know there are more and more great people in this world. The night ended with a few prizes, and we decided to share one of them with our blog readers. If you’d like to enter to win a session with Emily Levenson, a nutritionist, use the Rafflecopter form below. Good luck! If you follow me on Twitter or Instagram, you’ve probably seen these photos; however, take a look at all of my photos from the night over on Flickr. This entry was posted in Community Service, Giveaways, Pittsburgh Fun, Tote Bag Project and tagged #BlogMob #Hunger, Food Bank. Bookmark the permalink.